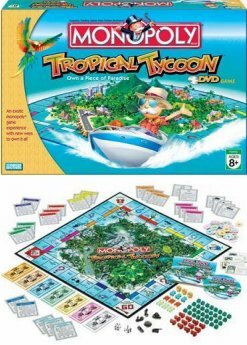 Paradise is in the tropics, and here’s your chance to make a fortune with this prime time real estate in the latest DVD game from Hasbro, Monopoly Tropical Tycoon. In the game, you take on a role like the Mayor, Police Chief, Developer or Surfer, each of which comes with different responsibilities and benefits, as well as special perks that can get you ahead! The interactive DVD brings the adventure to life and allows you to make decisions that change the course of the game. Land on a Chance or Community Chest space and go to the DVD for news broadcasts to get a news story or perhaps part of a continuing one. During the game, the Banker will announce auctions with the property going to the highest secret bid. You’ll also be able to improve your properties and increase your fortune with beach houses, resorts, parks, piers, and casinos. Your object is to build the biggest fortune by buying, trading, renting, selling, and developing island properties. If you can amass the most fortune points, you could own this island paradise! For 3 to 5 players, Monopoly Tropical Tycoon includes a game board, DVD, 28 title deed cards, money and banker’s tray, 6 island pawns, 32 beach houses, 12 resorts, 3 casinos, 3 restaurants, 3 parks, 3 piers, 60 fortune tokens, 5 ID cards and instructions. Note: This is an archive post; it was originally published on September 2, 2007.